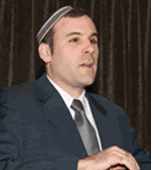 Rabbi Shalom Hammer has had the unique experience of having served as a Rabbi in the United States, and Educator in Israeli institutions and a Chaplain for the Israeli Defense Forces. He was sent numerous times to deliver classes to the Jews in the former Soviet Union and he has also led groups of American students through the fallen Jewish communities of Eastern Europe. These experiences provide Rabbi Hammer with distinct and profound insight on pertinent issues confronting the Jewish world both in Israel and the Diaspora. Rabbi Shalom Hammer received his Semicha/Ordination from Yeshiva University as well as a BA in Speech and Communications and a MA in Education from Azrieli Graduate School. Originally from Monsey, NY, Shalom and his wife, Gabi, made Aliyah to Eretz Yisrael in 1990 where he served in Tzahal under the Israeli Rabbinate branch of the IDF. Shalom has taught in some of the finest institutions in Israel, including Netiv Meir Jerusalem and Machon Gold College for Women. Rabbi Hammer headed an adult education program in Netanya, and was the Rav of the newly arrived eleventh and twelfth grade students from the former Soviet Union, in Hadera. In 2000 he was invited by the Rabbinical Council of America to act as Rosh Yeshiva of Ohr Hadarom in Rehovot followed by two years in the United States when he served as the Rabbi of Beth Jacob Congregation, Columbus, Ohio. Currently Rabbi Hammer teaches in the Yeshivat Hesder Kiryat Gat for post high school Israeli students. The Yeshiva is affiliated with the Yeshivat Hesder in Sderot. He serves as a motivational speaker for the IDF Rabbinate and is the author of The Family Parsha Book, The Eybeshitz Haggadah: Experiencing Redemption, and The Family Rashi Book.